Home conditions, crowd support and consistent performance of the past one and a half year make India the hot favourites in next month's cricket World Cup in the sub-continent, feels stylish Test batsman VVS Laxman. "India have the best chance to win the World Cup. I don't want to put undue pressure on the players by predicting the favourites. But I think the team can repeat the 1983 feat. They have the potential and talent to lift the trophy. The team has been performing consistently over the last year and a half," Laxman said. "The event is happening in India so we will have favourable conditions. With all the encouragement and crowd support, it will boost India's confidence," added the 36-year-old right-hander. The veteran of 120 Tests, who has not been part of the ODI fold since 2006, however, conceded that Mahendra Singh Dhoni's men will have to cope with towering expectations during the event. "There will be pressure but they are professional players and they know how to handle pressure. There is positive energy in the team and that is very important," he said. 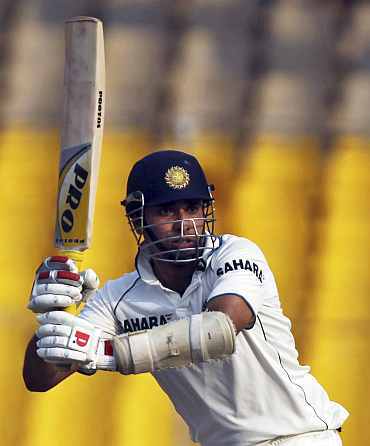 Laxman also said openers Virender Sehwag and Gautam Gambhir's form will be the key to India's campaign. "Gambhir and Sehwag have been very important players for India. They have been doing well and they will have a huge role to play in the World Cup after coming back from the injury," said Laxman, who is not in India's World Cup squad as he is now considered a Test specialist. While Sehwag is nursing a shoulder injury, Gambhir is recovering from an elbow injury. Both the players are expected to be fully fit before the high-profile event gets underway. Asked about the historic Eden Gardens being stripped of India-England World Cup tie on February 27 due to incomplete infrastructure-related work, the Hyderabadi batsman said, "Eden is a very important venue but I am sure that the remaining matches would be held there and people will enjoy them." Laxman brushed aside the fitness concerns with regards to some Indian players. "The fitness issues will be sorted out before the World Cup. They will go to Bangalore for training," he said. On being honoured with the Padma Shri recently, Laxman said, "It is a great honour. Whatever contribution I have made to the country in the 10-15 years has been rewarded. It's a very good feeling that I have been bestowed the Padma Shri." Laxman said India will miss the services of South African coach Gary Kirsten when he quits after the World Cup. "India will miss Gary. He has a huge influence on the Indian team and in the last three years he has done a wonderful job. There is no doubt that it will be tough to fill in his shoes. The environment he has created during his stay will remain forever with the team but he will be missed," said the cricketer. Kirsten took over as India coach in March 2008 and during his tenure, the team recorded Test and ODI series whitewash of Australia (2-0 and 1-0) and New Zealand (1-0 and 5-0) last year, both at home.